Note: This is a republishing of SG24-6489-00, which was withdrawn in error when we updated it with SG24-6489-01. This -00 book covers DB2 V8 while the -01 version covers DB2 V9, so we are making both books available. 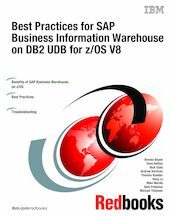 This IBM Redbooks publication describes the benefits of DB2® V8 for SAP Business Information Warehouse. It lists best practices and provides performance and tuning recommendations for SAP Business Information Warehouse. In today’s fast-moving business environment, there is a need for more and better business information. Data warehousing and business intelligence (BI) systems deliver that information. This imposes new requirements to manage, control, and use this data for business purposes. SAP Business Information Warehouse is the central reporting tool for almost all SAP business solutions. It is based on building blocks called InfoObjects that contain data about customers, sales, and business information. InfoObjects include InfoSources, ODS objects, and InfoCubes. The business intelligence solution from IBM and SAP can help you aggregate and leverage this information, giving you a system-wide view of your business data and delivering it across your enterprise to support sound business decisions. However, this structure can lead to slow performance if the system is not set up and managed according to good database principles. This book describes best practices for this product on a zSeries® platform, and provides performance and tuning recommendations for loading and querying data. It also addresses general system administration and troubleshooting. The audience for this book includes SAP and DB2 administrators. Knowledge of these products and of the WhitepaperRedpaper z/OS® environment is assumed. This book is designed to aid the reader based on specific needs. After describing the product and summarizing its advantages on the zSeries platform, we list best practices for the PSA, Infocube, ODS, and DB2 components. We give tips on how to gain efficiency when using compression and indexing. We also include a troubleshooting chapter that describes what to do when best practices do not address a problem.